Three story townhouse near Heavenly Valley Ski Area/Nevada Casinos. Townhouse is located in Lakeland Village, an all seasons resort, a 19 acre property. Convenient shuttles to all major ski areas and casinos. Amenities: Two swimming pools, 2 Jacuzzi's, sauna, 1000' private beach, two tennis courts with pro. Shopping and restaurants adjacent. Ground floor entry with inside ski storage. 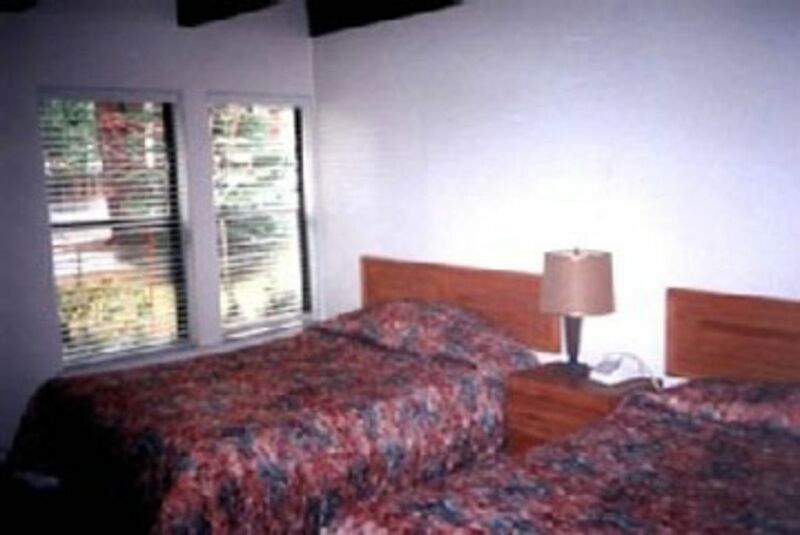 Large bedroom with 2 queens on 1st floor, color TV on the cable with VCR, bathroom, dressing room, washer and dryer. Second level has wood burning fireplace with gas starter, color cable TV with Dvd/CD player, balcony with large Weber BBQ, dining area, bar area and fully-equipped electric kitchen. 3rd level is 2nd bedroom with large double bed. Roll-a-way in unit as well. Linens and towels provided. Nevada casinos are one mile from property, offering gaming, shows, fine dining and entertainment. Golf courses are all around. Heavenly Village shopping is one mile from resort. In addition to Heavenly Valley, other resorts in the area are Kirkwood, Sierra-at-Tahoe, and an hour away are Squaw Valley, Alpine Meadows, Northstar and Diamond Peak at Incline. Shower and toilet are in one room, sink and vanity are in a second room by the first room. Land line in kitchen and 1st floor bedroom. Charge for long distance calls. Parking pass required. Spaces available. Provided by Spectrum. Pass code given to guests by owners. Electric 30 " range with 4 burners, full size oven. The dining table has 4 chairs and can easily fit 2 of the porch chairs. There are 4 tall stools at the living room side of the counter and this makes for additional dining. 2 Televisions with full cable services. One in living room and one in first floor bedroom. Off the living room. Deck chairs provided. 2 Tennis Courts. Reserve and pay at the Lodge Front Desk. 1 by the pool by the lodge building inside near the work out room. 2 pools--one by the lake/beach and one by the front lodge building. One at the lake pool area and one by the front lodge pool area. We loved staying at Bettie's condo. Lots of room for 5 adults, so close to the beach which we really enjoyed. Super clean with a well-stocked kitchen. The shuttle bus was a great way to get into town and back, so that was an added plus. Bettie was very easy to work with and even shared a story with my daughter about a 15-year-old who swam across the lake. We would definitely stay here again. Sherri and her family were awesome guests and were a pleasure to have as guests. They enjoyed all the facilities at the resort as well as our townhouse and I would be happy to have them as guests again. They left the house in excellent condition and it was a pleasure meeting Sherri's daughter! They are welcome anytime! The property is at a very convenient location in South Lake Tahoe close enough to casinos and evening entertainment but right on the lake for a great day at the beach. The home, while a quaint townhouse, has everything you need in the updated kitchen and very well organized for ease of use. I was also pleased by the cleanliness of the unit. The owner, Bettie, was a sweetheart to work with in providing ample information about the home and for ease of the check-in and check-out process. Would definitely stay here again! Nothing fancy but all your necessities are covered. We enjoy going to Lakeland Village as we have for 30 years. Great family location on the lake. Amazing stay in an amazing rustic setting. Don’t let only two photos throw you off booking this property. It is an amazingly spacious and beautiful place in a beautiful setting. A working fireplace will really make you feel at home here! Around a $10 uber to the heavenly resort and a 30minuet car ride to seira at tahoe. Me and the two others who stayed here really enjoyed our trip and felt Bettie (the owner) was very helpful and responsive. Also had full deposit back. Property was great for a family of 4. Resort hot tub + pool and proximity to lake made it an ideal location for us. Kitchen is fully stocked. First let me say I didn't stay here in May 2013, however, I rented this unit for about 4 years straight for a week in July, and after reading the 1 star review felt like I had to chime in. The pictures clearly show this is not an ultra-modern luxury unit, if you want that go down the street to Sierra Shores where the nightly rates are equal to the weekly rates of this unit. What this unit is, is clean, comfortable, and extremely well located, just a short stroll to the beach, and access to all of the great Lakeland Village amenities. The linens were always clean, as were the dishes and all of the utensils. Finally, in the 4 (it may have been more) years I rented the unit, the owner did not deduct $1 from my security deposit. In fact, on more than one occasion, I left something behind, and she returned it to me free of charge. I have decided to expand my summer vacation destinations, however, if/when I return to South Shore, I will be renting this unit. Thank you for your honest review of our townhouse! Our cleaner is excellent and we like to make sure our guests enjoy staying in our place. We visit often and always take care of anything at the house that needs attention. We feel happy to have satisfied guests who enjoy their stay in our house and the amenities at Lakeland Village. Lakeland Village Resort is the location of our townhouse. Lakeland Village is one mile from Heavely Valley Ski area and one mile from the Nevada Casinos and the Gondola to Heavenly Valley Ski Area. Linens and towels provided. Professional clean between guests. $50.00 cleaning fee per stay.